An article I was reading in this week’s Economist magazine reminded me of Color Oracle, the software Bernhard Jenny (Swiss Institute of Cartography, ETH Zurich) developed to silence my continual prodding after listening to Cynthia Brewer talk about color blindness (color vision impairment) at a NACIS conference in 2000 (?!). It struck me there should be a tool that actually allowed the designer to see what their design looked like to someone with this impairment and not just try to make something work using limited “blessed” color combinations. An earlier effort produced Sim Daltonism, a Mac only tool that does a similar job as Color Oracle. Color Oracle takes the guesswork out of designing for color blindness by showing you in real time what people with common color vision impairments will see. Color Oracle applies a full screen color filter to art you are designing – independently of the software that you are using. Eight percent of all males are affected by color vision impairment and it’s good to make sure that your graphical work is readable by the widest possible audience. This software is free and works on Mac, Windows, and even Linux. Get it here. Back to the Economist graphic on real prefectural spending per person in Japan This graphic uses a divergent color scheme that is convenient for most readers, but hard to read for others. The strong hue contrast between the red and green segments of the legend’s color ramp becomes hard to distinguish for people with color vision impairment (see 2nd image past the jump for simulated view using Color Oracle). Yes, if you try hard you can still figure it out. But the point is the strong contrast has been replaced by confusing contrast. It would be much better to use a different color combination like blue and red, as demonstrated by this recent Washington Post graphic (below) which also used a 2ndary visual variable of arrangement (blue always on left for Democrats, red always on right for Republicans). 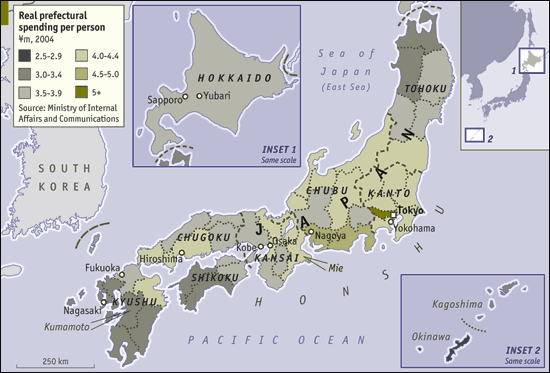 Harder to use arrangement in the Japanese choropleth map example, but it’s always best to emphasize the difference with a second variable (like value and saturation in the case of color). the most common form of color vision impairment. To learn more about the design of information graphics and maps that are accessible for color-impaired readers, please have a look at our article in Cartographic Perspectives 58, p. 61-67: Color Design for the Color Vision Impaired. Lo res for screen reading (706 KB) High resolution for printing (20.3 MB). This entry was posted on Thursday, March 13th, 2008 at 10:09 pm	and is filed under Best practices, Charting, Design, Mapping, Print, Self promo, Software. You can follow any responses to this entry through the RSS 2.0 feed. Both comments and pings are currently closed. I’ve used SimDaltonism a bit over the past few months — it’s a neat bit of software — and it really is a bit of a shock sometimes to realize that colors that look perfectly distinct to my eye can look almost uniform when seen through one of the color-blindness prisms. Gotta love google, very neat stuff. Thanks…. As a colorblind geography teacher in training, I am searching for related research on map improvements for the colorblind. I will have to do a little designresearch of my own as part of my internship. I’m now looking for literature on the subject (found C. Brewer’s stuff already, and now also yours!). This blog sure helps me!